Natural + Local = Sustainable. Started in 2013 by Ken Norton and his wife Yuka, in an effort to improve the quality and taste of the food they could feed to their family and share this food with their community. Ken is an entrepreneur and chef with local and international culinary experiences and influences, so food really means a lot to him and in his own words “good food is getting hard to find.” The farm does not just produce one or two products like a typical farm, instead it operates more like a homestead and produces a multitude of crops and livestock which support each other using permaculture and other organic methods. 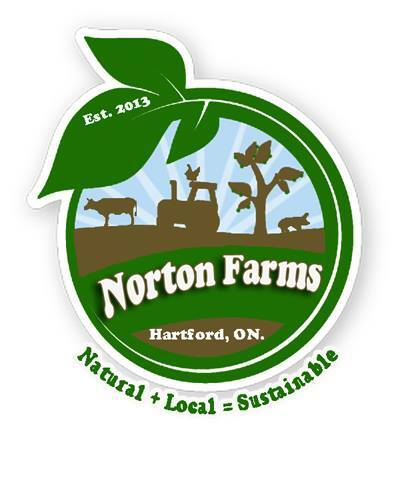 Everything that comes from Norton Farms is naturally raised. Organic principles are employed on the farm This means the eggs, beef, pork, chicken, turkey, and muscovy duck are raised with no antibiotics or hormones. This also means that fruits and vegetables are produced with no chemical pesticides, all seeds are Non GMO; and are not chemically treated. Our farm is nestled in the small hamlet of Hartford Ontario, just South of Brantford, North of Hagersville and East of Waterford. Our location offers us a peaceful setting in which to raise our children. We think “local first” and focus on family and community building. From that starting point, we develop relationships where mutual respect is the foundation. We understand that education is key, and we are constantly learning and sharing what we learn with others. Our form of agriculture is the science and art of sustainability. Our philosophy is that farming practices should leave the soil, air, water, plant life, animals and people healthier – and happier. We are a proud micro farm (a.k.a. small family farm) farming under 100 acres.